One of the many ways in which you can adapt your PowerPoint slides to an iPad friendly format is by converting all your slides to pictures. This approach will work well for slides that have no animation or multimedia -– and the good news is that great presentation slides can be created without animation or multimedia of any sort. The bad news is that this is a one-way street -– and if you want to make any changes to your slides, you will have to edit your original presentation and convert the slides again to individual pictures. Figure 1 shows the 16 slide presentation I started with — these are all slides from a Photo Album presentation, and each slide has a photograph and caption. Your slides may be like more conventional PowerPoint slides, and it does not matter because the process for all types of slides is the same. To convert your individual slides to pictures in PowerPoint, you summon the Save As dialog box and choose JPG or another graphic format as the file type. We have instructions on exporting your slides as PNGs in PowerPoint 2010 for Windows, and the process works the same way to export JPGs in any PowerPoint version on both Windows and Mac. You will ultimately end up with plenty of pictures that are suffixed with their original slide numbers –- the first slide in your 16 slide presentation will be named Slide1.JPG, and the last slide will be named Slide16.JPG. Of course you may not have 16 slides — that’s just the number of slides that I started with, as shown in Figure 1 above. At this time, it is a good idea to rename your first 9 slides so that Slide1.JPG now reads Slide01.JPG (see Figure 2 below). Thereafter place these slides in a folder that is indexed by iTunes. 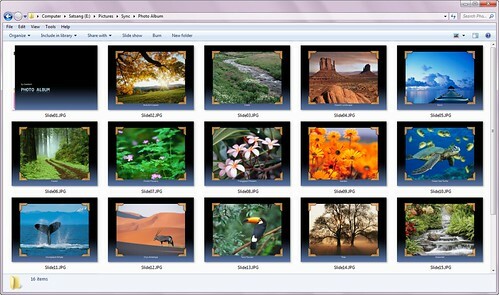 To learn more about how iTunes indexes picture folders, search the term add photos to iTunes library on Google. Depending upon which version of iTunes you are using, or if you use Windows or a Mac, the process may differ. 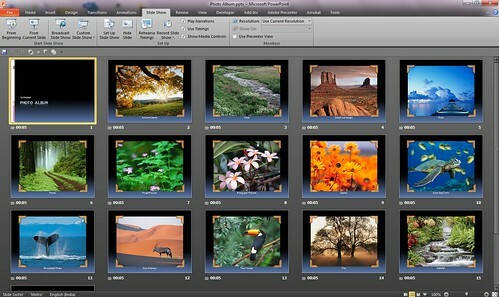 Apple also has a great tutorial called Syncing photos using iTunes. The next time you sync your iPad (both iPad 1 and 2) with your iTunes, the slide pictures will be copied, and available within your iPad’s Photos app. 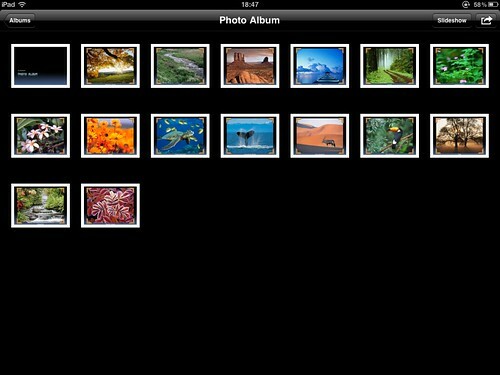 Once you have synced your iPad, launch the Photos app on the device to see if all your slides have been imported as pictures –- also make sure that they are sequenced in the order you want to show them as slides, as shown in Figure 3 below. Thereafter you can show these picture slides off your iPad -– moving on to the next slide is as easy as moving on to the next picture. And since the Photos app is AirPlay aware even on iPad 1, you can use it with an Apple TV or even a VGA cable connected to a projector. This may not be the most elegant way to transport your PowerPoint slides to an iPad, but it does work. Note: Even though Apple’s documentation says PNGs are supported by the Photos app on iPad, and by iTunes to sync, I found that iTunes ignored all PNGs — that may be just a coincidence but JPGS do work the best.